View More In Air Conditioning Oils. 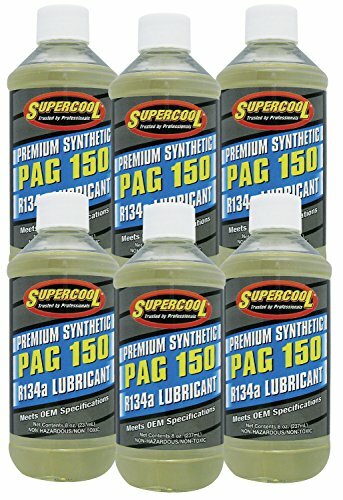 TSI Supercool P150-8 PAG 150-Viscosity 8-Ounce - Case of 6 is a high performance synthetic PAG for R134a systems. It provides excellent resistance to moisture. Anti-wear agents and friction modifiers enhance compressor and A/C system efficiency while reducing the compressor wear rates. This extends your compressors life. Anti-oxidants protect your systems against the formation of sludge and other deposits, which can shorten compressor life and reduce system efficiency. It meets OEM performance specifications. Supercool customers receive industry's leading technology in all fluids with lubricants and UV dye's formulated to meet or exceed OEM performance specifications. In addition, all lubricants are top-off compatible with their corresponding OEM and aftermarket equivalents. Designed for real-world operating conditions, they provide an unsurpassed level of service, performance, protection, and fluid life.